This year Batavia High School is making a change to the campus to benefit students and the environment and to enhance their biodiversity. 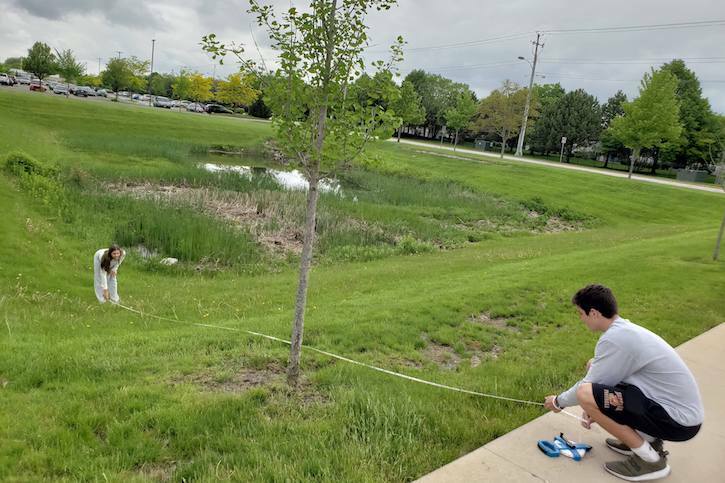 BHS teachers Donna Detrick and Daniel Renz have given their students the opportunity to plan and create an eco-friendly area on the school’s campus. The “living classroom” can be used for science classes to study ecology, as well as a relaxing area for students of all classes to work in a nature-friendly environment. This year, students are starting the three-year plan. Eco-club members met with a specialist to get help on more challenging tasks in the process of the new outdoor living space. “We have a pretty campus, but environmentally not too diverse,” Detrick said. To accomplish the living classroom, all biology classes will play a role. The AP Environmental and Eco-club students are collaborating with biology classes to begin establishing gardens. In addition, locations have been marked to create a gardening design. Benches and paths are planned to be included in the outdoor living area. Biology students have hope that after their three-year plan is complete, our school will be left with a self-sufficient garden and pond for students to learn, study, and enjoy the environment. Thanks to the communities funds and donations, these students have been able to pursue their plans. “The area will be a big, very pretty garden…with aesthetics in mind. There will be paths for mini-hikes or to get in and view the plants,” Detrick said. Not only is this area for aesthetics, but it is purposeful for the environment.